This year's CEDIA trade show in Denver saw Epson refresh its entire home theater projector line. The Epson PowerLite Home Cinema 5030UB is this year's upgrade to the Home Cinema 5020UB, one of last year's hottest projectors. While the 5030UB is in many ways an incremental improvement over its predecessor, it is an impressive machine in its own right. The Home Cinema 5030UB is one of three new home theater projectors released at this year's CEDIA show. The others, the Pro Cinema 4030 and Pro Cinema 6030UB, are restricted-distribution products sold through specialized dealers and custom installers. The Home Cinema 5030UB, on the other hand, is in open distribution -- meaning you can find it at a number of authorized resellers online. Currently priced at $2,599 from authorized sellers, the Home Cinema 5030UB is an excellent value in today's market. While the projector is laden with features that make it easy to install and use, the primary draw of the Home Cinema 5030UB is image quality. The 5030UB's image in both 2D and 3D is the best we've ever seen from Epson, and the picture on screen makes it clear where every single dollar of the projector's purchase price went. In other words, it looks more expensive than it actually is. The Home Cinema 5030UB is built primarily for use in a light-controlled home theater environment, and it is tailored to deliver maximum impact in such a situation. The "UB" in the projector's name stands for Ultra Black, a designation that does not disappoint once you have the projector properly configured. For part of this review we set up the 5030UB on one of Stewart's new screens, the Cima by Stewart Filmscreen using the 1.1-gain Neve white fabric. This screen is a superb complement to the 5030B for dedicated home theater, and it costs less than the Studiotek 130. The 5030UB already has very deep black levels and light output is highly adjustable, so this neutral white screen with low gain and a very wide 80-degree half-gain angle is ideal for dark theater installations. In 2D, the 5030UB's image is smooth and life-like. Highlights are bright, but not blown out, while shadow detail is excellent and overall dynamic range makes the image appear three-dimensional. Black level, which has long been the strong point of Epson's home theater projectors, is as deep as it has ever been once the projector's automatic iris is turned on. The Home Cinema 5030UB shares the color performance of its predecessors, with good color saturation and comprehensive color adjustment controls. The projector's factory configurations need a little bit of fine-tuning, but this isn't unusual in home theater projectors. The 5030UB produces a bright, engaging 3D image that makes large-screen 3D display attainable. The projector has three dedicated 3D color modes that can be fine-tuned independently of their 2D counterparts. Bright, well-saturated colors and good shadow detail make 3D viewing a pleasant experience, even for this jaded reviewer. If you still watch a lot of standard-definition content, technologies like Frame Interpolation and Super Resolution improve image quality and give new life to your DVD collection. And while no amount of image processing can turn SD into HD, the Home Cinema 5030UB can clean up standard-definition material enough to make it easier on your eyes, now that you're used to high definition. Nice review. Only concern is blur in game mode. Would love to see a shootout vs the Panasonic PT AE8000U. Well, there are plenty of 5020 vs. AE8000u reviews out there, and the 5030 is essentially a more refined 5020 with even better blacks, so there's that. As mentioned in the review, this does have a "game mode" of sorts (fast image processing instead of fine) that brings lag down to 37ms, which is lower than the 50ms the 5020u managed at it's best and slightly lower/on par with the AE8000u, which manages 41ms in game mode. I played a couple hours of COD on my 360 earlier tonight on my 5030ub, which I set up yesterday, and it seemed fine to me. I'm usually pretty sensitive to lag like old LCD TV's and such used to have. So it seems there's very little to differentiate between the 5020 and 5030. That's a shame, as I was hoping Epson would bring some of the features that the Panasonic holds over them with this model - namely the auto zoom/focus and lens memory. I feel they've missed an opportunity here to make it a no-brainer over which to choose, particularly as it seems Panasonic are not releasing a new model this year. Great review, Bill. By any chance did you calibrate any of the 3D modes? I have a 5030 and I'd love a launching point for the 3D calibration. I downloaded the 5030UB manual from Epson's website, and on page 50, one of the display modes is "Anamorphic Wide" described as "Displays images that have a 2.40:1 aspect ratio when using a commercially available anamorphic lens". This was not listed in the manuals for the 5020UB or 5010UB. Is Epson's manual wrong, or has this been overlooked? quick question concerning european line-up. What are the corresponding numbers here? some help is much appreciated so i read the right reviews and dont get mixed up and make the wrong decision. Tony - A shootout is coming very soon. Stay tuned! Geoff - Actually, the AE8000 measured 34ms. The AE7000 was 41ms. Craig - I agree that powered lens adjustments would be a welcome addition, and we discuss the impact of manual adjustments in our review. However, such a feature would very likely make the projector cost more than it does now. Elio - I did not calibrate the 3D modes, but 3D THX is already pretty close to 6500K. Unfortunately it is also the dimmest of the three 3D modes. Eddie - The manual is incorrect. The 5030UB definitely does not have anamorphic stretch, though the 6030UB does. I will inform Epson of the mis-print. Maarten - I'm checking with Epson and will get back to you. Excellent review as always on what looks to be an great projector! "using the telephoto end of the zoom lens, which can reduce light output by up to 44%"
At what distance in feet does this come into play? The calculator in you site recommends 14 feet (10 - 22 range) for a 105 inch screen. I would have to agree, there have been plenty of Shootouts between the Panasonic AE8000 and the Epson 5020ub and pretty much the only advantage to the Panasonic was the motorized lens with it's memory. I would actually of loved to see a comparison to Sony's Sony VPLHW50ES or 55 to see how close the Epson has come. I wonder if they have sorted the awful discrepancy in panel alignment. I bought a TW9000 (5010) which was almost unwatchable for text and subtitles. When I sent it back for warranty, they tried to align it electronically and the result was even worse when it was returned. When I complained, Epson said it was within spec for manufacturing and I would have to live with it. I ended up selling it for an $800 loss. So much for warranties. Never again Epson! Hi Bill, quick question: What method do you use to test lag? Do you have an actual HDMI lag tester (such as the one made by Bodnar) or are you using a CRT, or something else? Could you please explain or elaborate on this: But the maximum telephoto setting, which produces the smallest image size at a given throw distance, restricts light output by 44%. As an example, THX mode drops from 512 lumens to 287 lumens with the lamp at low power -- a significant reduction that could affect your choice of screen size. This is important to keep in mind when mounting your projector. For a given screen size, is closer better? I have an Epson 8350 w/ a 106" VApex screen in a light controlled theater. How much am I going to love the 5030UB??? Maarten, I've received an official response from Epson regarding European model numbers and it looks like Nikko was correct. Here they are. Kelvin, the drop in light output is linear. In other words, using the midpoint of the zoom, you lose roughly 22% of the projector's max light output. Michael, the Sony HW55 should be on its way to us now, and we will certainly do a comparison. GeoffTB, that's unfortunate. We did not run into any major alignment problems, though our 5030UB was slightly mis-aligned on arrival. We fixed it with the Panel Alignment feature. Josh, right now we use the dual-display method, but our Bodnar lag tester is on its way. When it arrives, we will re-check the projectors we have on hand to find out what the differences are. Chris, not necessarily. Placing the projector closer to the screen increases light output, but light output is not the be-all and end-all of image quality. Using the maximum wide angle setting also increases light scatter and makes screen illumination more uneven. Optically speaking, the ideal is using the mid-point of the zoom lens, but 1080p is nowhere near enough resolution to tax most projector lenses from an optical standpoint. I know you were looking for a quick answer, but it's not an easy question. We will be addressing this topic more thoroughly in the near future, so stay tuned. Bill, what an excellent review! I was thinking on buying this epson model after reading cnet's review but had my doubts/questions until now that I read your article, twice! Congratulations on such detailed and comprenhensive writting. I can see you have a kind-of "direct line" with epson so I would like to know when this 5030UB and the 5030 UBe will be really available? I called epson and the customer service rep didn't have a possible date of availability... I will deeply appreciate any info you can find on this matter. Cheers, Felipe. Bill, thanks for the reply. I got my Bodnar tester a few weeks back. Takes a while to arrive from England, but it's totally worth it. Makes testing lag down to a tenth of a millisecond as easy as pressing a button. Josh - we actually received ours about an hour after I posted my comment and I'm working with it today. Expect results later this week. I see the 5020UB fac refurb is $1899 now and I am tempted to save $700 over the new model. This would be an upgrade from the 8350 I've had for 3yrs- and I'm really interested in better black levels and possibly upsizing from 106" to 120" screen. Help! Which one!! Have you heard anything yet on when the UBE model is shipping? It seems that the date keeps slipping and not sure about the stock that is out there on eBay and other places for way more that the $2899. "For the do-it-yourselfer, the 5030UB's lens configuration screams "rear shelf mount."" Hope you have a big shelf because this thing is pretty massive! My current projector BARELY fits on my shelf as is and this one is 7cm deeper. Yikes, might buy this one but I seriously gotta buy a new shelf first! We have a Sanyo PLC-XP21N that is finally giving up the ghost after 10 years. Great for all those years. 2400 lumens (a lot for back then). Wondering if the 5030UB is a good replacement. Key fact - we've been using it in a family room configuration with french doors to the outside, pool table, etc. The PLC picture always held up well in daylight without direct sun coming in the windows. Of course it was always better at night. I see the 5030UB is also 2400 lumens like the Sanyo. I know the lumens rating is always a moving target - anybody know if the 5030UB would do okay in such an application? Thanks for any help. sorry for my late response but thank you very, very much indeed for sorting out the differences concerning the european and US numbers!!! greetings from the other side off the ocean! Bill, thanks to your great review i finally decided to buy the epson 5030ub. you are right it is a great projector, kind of big. I had to built a rear shelf mounting to place it, it is heavy! it works nice even with some light. my only issue is that I could not place it exactly perpendicularly in front of my screen, it is around 4 feets off left, with lens shift i moved the picture to fit into my screen, however as a problem I do not get a perfect rectangular picture. it is not bad and i can correct with keystone, however I saw picture loses some quality with keystone adjustment, do you have any good tip for getting a perfect rectangular picture mithout moving the projector exactly to the front of my screen (my room doesnt allowed me to do that)? thanks again for your review, it helped me a lot to make my decision for what projector to buy. I purchased the projector based on you review and I couldn't be happier!!! The Epson web site has good screen size and distance calculators for you to use to figure out size and distance for your room. They are easy to use. Check out their web site. G.
have you done already some more input lag tests? My favorite projector is the EPSON TW7200. Is the TW9200 really faster than the TW7200? Is the TW7200 fast enough for gaming? What happens when we use other input ports? Is it faster with the PC- or Component-input-port..? Something to share with you all regarding the projector's matching up with different screen... i have been using Kikuchi MTSR 90" HDAM screen for years and have no problem with my other Panasonic & Sanyo projectors. When I installed my Epson TW8200 (HK model no. which is equal to 5030UB), the image revealed a large area of light grey strips that looked like water mark. To my great surprise, I just merely reduced the zoom range from its widest 100% to 95% (i.e., screen width from 90" to 86"), the water mark disappeared! to me, it didnt need len shift but only reducing the image size a bit. thus i can keep the maximum no of pixels and wont have any adverse effect at all! I put off moving to a projector for a long, long time. When the 5030UB came out, I debated between going with a high-end 60-inch Panasonic plasma and this projector with a 100-inch diagonal screen. My old Panasonic Tau large screen tube TV was starting to fade, and it was time to make a decision. I decided on the Epson. Of course, the true test of any purchase of this kind is having it pass the "Wife Test". When I finally got the system set up in the basement, I asked my wife for a review after watching some of the Sochi Olympics. Her comment was, "Well, it's okay, but you know I'm not into all the multimedia stuff". So I decided to switch gears a little, and next evening dropped in a DVD of "Winged Migration". That was all it took. She was sold. Watching that flick with the picture quality thrown onto the screen by the 5030 almost makes you feel you are flying along with the rest of the flock. My hyperactive 5-year-old was rapt with attention. I am sold, and am extremely satisfied, as is the wife. Thank you Epson for an exceptional product. Hi Bill and everyone, first thanks for such a great and detailed review, as are all of your reviews. Even with the details, I still have some questions that I can't seem to find the answer to. Using your projector calculator, if I mount the projector with a throw distance of 13'3", that provides a 100" screen size, which are perfect measurements for my set up. If I understand this correctly, I wouldn't have to adjust the lens at all since I already have the desired screen size, correct? In which case, what position is the zoom lens in at any given throw distance for a given screen size according to the projector calculator? Is this a starting point and then one can use the zoom to create a smaller or bigger picture since they may be limited to throw distance but want or need a smaller or bigger picture? This detail I believe would help many people understand the light output at their distance. Thank you in advance. I just purchased this projector. It is a big upgrade from my Benq PE7700. I currently have a Dalite 106 inch fixed screen with a HCCV screen. This screen has always looked to sparkly on the whites during viewing. It is even worse with this new projector. Would you suggest a white screen or a grey screen. I am looking to get away from the sparkly view on bright scenes. I am wondering if someone could help me find a anamorphic lens for TW9200. I am trying to Google the part number and could not able to find anything relevant to this model. Any help is much appreciated. Always a fan of the site, bought my first projector long time ago after reading reviews. Epson 6500UB and have been super happy with it. It's 1080p, my use turned from movies to every day. Video games, movies, tv, sports, all are good with the 6500. Wondering though, is it time for an upgrade to the 5030. Not big on 3d so thats not a major feature for me. But how much different is a 6500 as still 1080? I have blackout blinds so light not really an issue. Suggestions? Buy a $300 replacement bulb or upgrade? I was wondering if you could tell me your opinions. We had a Sanyo C4 projector for nine years that I loved and that recently stopped working. We bought an Epson 5030 and it is too bright. I find myself blinking the whole time while watching it. We had it set to low for the bulb, and THX mode. My husband said he tried lowering the brightness but then the image was bad. I can't stand watching it! He called the place where we bought it and they said it will be a $300 stocking fee to return it and that all the projectors nowadays are just as bright. Is that true? Are there others that aren't so bright and harsh on the eyes, or that can be adjusted? We do all our watching at night so we don't need daytime brightness. The dealer was correct. Most projectors these days are quite bright. I can’t find a Sanyo C4 in our database. I will assume you meant Sanyo Z4, since that came out about nine years ago. Our favorite settings on that projector measured about 300 lumens with a fresh lamp. Since you’ve had it for a long time, I’m going to assume that the lamp was not new, and was probably only producing 50% of its starting light output. So as an estimate, let’s say you were getting 150 lumens onto your screen before the projector stopped working. The Home Cinema 5030’s THX mode measured roughly 500 lumens in low lamp after calibration — over three times as much light as you were getting from the Z4. No wonder it looks so bright! The Brightness control sets the projector’s handling of black, but it has no effect on the actual light output. That’s why it looked bad. If the projector is placed on a rear shelf, go out and purchase a high-quality Neutral Density filter. These are used for photography. They reduce light transmission without affecting color balance. An ND2 filter will only transmit 50% of the projector’s light, or 250 lumens. An ND4 filter will only pass 25% (125 lumens). If you have ceiling-mounted your projector, you can still mount an ND filter, but you’ll probably have to build yourself a bracket. That can be difficult if you’re not a handy person. You don’t mention what kind of screen you’re using, but low-gain screens will reduce apparent brightness, so that is also an option. If you have any flexibility in mounting, the Epson 5030UB’s lens transmits less light when it’s farthest from the screen, so you could reduce light output by up to 40% by placing it as far from the screen as possible. Could someone comment on the difference between the new Epson model 3500 (released in 2014 and is a bit cheaper) and the 5030UB? Is it worth to pay more for the 5030UB? What is the 5030UBE difference? Thank you! I am looking at 5030ub for my dedicated theater room. I have a 138 inch screen 2.35:1. Will 5030 be able to handle this aspect ratio ? The difference between the two 5030ub and the 5030ube is the 5030ube has wireless hdmi transmitter built in. You would only need to run power to the unit. I'm looking for an opinion on whether I should buy the Epson5030 or Epson6030 Pro Home Cinema for my home theater. Other than one being black/white and coming in a bundle, is there really a difference?. You should use Projection Calculator Pro to figure out the correct distance.I would install the 5030UB at 19.7"for a 120" Don't use the full zoom on the projector. For 35' room bring the projector closer to the screen. Full potential out of the 5030Ub install it at 16.4feet. 150" won't work. I am thinking on buying Epson 5030ub. Anybody has any issues reading the lamp/bulb life? No issue. Use the menu button and scroll on the column of the left hand side. I'm away from my Epson 5030ub but its easy to find. I'm comparing the Epson 5030UB ($2,299.) and the Panasonic PT-AE8000U ($1,499. Both specs are almost identical. Why should I get the Epson for $1000 more? I wish Bill Livolsi could give me his input. Robert - the extra $1000 for the Epson 5030UB gets you a panel alignment system, deeper blacks, RF 3D glasses, better detail enhancement, and lower input lag in the projector's fastest mode. You give up powered lens adjustments, a slightly quieter fan, anamorphic stretch capability, and a third HDMI port. Those are the major differences. Thanks Bill. I'm convinced. Epson for me! I purchased the Epson 5030UB. I'm trying to understand "Tele" vs "Wide screen". My screen is 100" diagonal. My previous mount is 132" from the screen. Would this require that I use more or less of the tele side of the zoom feature. Epson PowerLite Home Cinema 5030UB has surpassed all my expectations for the perfect projector. After several months with 5030ub I'm enjoying my own best movie collection all over again.It's surprising what i was missing before. Note:Epson sent my free bulb. Note:Epson sent my free bulb. --------------------- How? I'm planning to buy this projector, with the 158" Silver Ticket GREY screen. The room is mostly dim but white ceiling and walls and plantation shutters. Is this an appropriate setup or should I go with something else? I bought the 5030UB, which seems to be a great projector, standing an amazing capacity of projecting in a clear room. However, I'm facing a problem, since it is not fitting my 120" 16:9 screen (when I adjust the zoom lens to fit the whole vertical/height, the width exceeds the screen 3 inch in each side. Otherwise, if I fit the width, the projector is unable to fit the whole height of the screen. I have already adjusted keystone to maximum height/minimum distortion, and I believe the projector is well mounted and aligned. I did not find a set up item to deal with this issue. Since it is set to HDMI, I'm also unable to change the image aspect. Changing the setting in cable box does not produce any changes. The 5030ub we bought last summer is getting to be an expensive proposition already. The lamp fried with way less than 100 hours on it. We haven't watched it as much as I hoped we would and I'm highly aggravated that the lamp has so far cost over $2.00 an hour to run. I call BS on any 4,000-hour lamp life claim. Great image, but at what price? Be ready to spend a ton of cash on lamps. And I have it on a a high-end Furman F1000 UPS to make sure the power doesn't drop with a hot lamp. Bill said "Robert - the extra $1000 for the Epson 5030UB gets you ......., and a third HDMI port. Those are the major differences." I have one for about a year now and very happy with it but there is only 2 HDMI Not 3. Walter - I have the same question as to playing old movies in their original (at least for DVD) aspect ratio...want to play them in 4:3 but although the 5030UB indicates compatability a few footnotes cause me concern as to how to do 4:3 if it can't be done through HD or HDMI...help on this question, Bill L? Walter, I have the exact same setup and the exact same problem. Have you found a solution yet? I too am experiencing the same issue as Ethan and Walter. (5030ub nut filling entirety of a 16:9 120" screen.) Please let me know if you find a solution. Did you level the projector? Keystone I believe only works for lens shift. I hope people realised by now that they can zoom-in and ZOOM-out using one of the 2 dial around the lens before tempering with the keystone and make sure that the projector is perpendicular with the screen is as important as level. I have 120 in screen at 14ft distance no problem filling-in the screen. Good luck. 1. Level it (roll and pitch using a torpedo level). 2. Start the pattern from the remote. 3.Fill screen using zoom ring to match the while borders of the pattern to the edge of your screen. Starting from the 0 position of lens shift (hor and ver) center the image. 3. This usually gets the job done. Even if there is a slight spill over, it is not noticeable at the viewing distance of about 9.5'. The dials are a bit clunky and it is hard to move them without shaking the PJ but do the best you can. I could post some images but there doesn't seem to be a way of doing that here. I did my own shootout with the ae8000u vs the 5030ub and so far I am keeping the 5030ub. 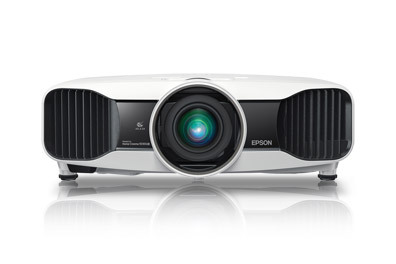 Epson forces the projector into full power mode in 3D and with full power mode comes a significant fan noise. It is enough to where the projector is easily audible on quiet movie scenes with the projector 3ft behind me and 4ft above me. The picture looks great but it is significantly louder than the epson Home Cinema 3500 (which is significantly cheaper). I may have to bring in a Sony hw45es before making my final verdict of which to keep. I would go with Sony for when i need a new Projector. Input lag and poor service being my concerns. The unit i bought was faulty and it was replaced with a refurbished unit. Maximum screen size is a function of projection distance and zoom. If you want responses about either, post both.